Within the science and policy communities, carbon emissions from deforestation and forest degradation have been estimated to account for about 20% of global anthropogenic CO2 emissions. A recalculation of this fraction using the same methods, but updated estimates on carbon emissions from both deforestation and fossil fuel combustion suggests that in 2008, the relative contribution of CO2 emissions from deforestation and forest degradation was substantially smaller, around 12%. A graph in the paper (click on the image above to see the large version), illustrates the problem clearly. 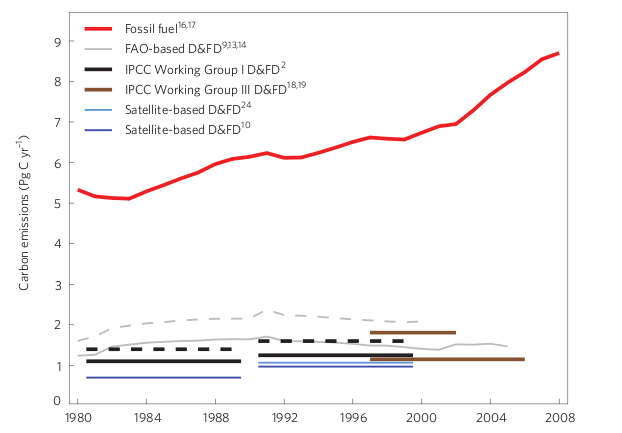 Since 1980, emissions from fossil fuels have increased from about 5.2 Pg C / yr to about 8.5 Pg C / yr. Meanwhile, revised data on emissions from deforestation and forest degradation indicate that emissions from forests are lower than the IPCC’s 2007 figure. Van der Werf and his colleagues recalculated the figure using the same methods as the IPCC but using updated values for deforestation. They came up with a figure of 1.2 Pg C / yr, or about 23 per cent less than the figure the IPCC produced in 2007. Land degradation that does not involve changes in tree cover density, such as oxidation and combustion of deforested and drained tropical peatlands, may also involve substantial carbon emissions. However, losses of these non-forest carbon stocks are not generally included in deforestation and forest degradation assessments, as summarized in the 2007 report of the Intergovernmental Panel on Climate Change (IPCC) Working Group I, nor are they considered in policies aiming to reduce emissions from deforestation and forest degradation (REDD). [R]eplacing peat forest with oil-palm plantations may not change the tree cover density, but it does lead to a large pulse of CO2 emissions because of reductions in both tree biomass and soil carbon. In short, the maximum reduction in CO2 emissions from avoiding deforestation and forest degradation is probably about 12% of current total anthropogenic emissions (or 15% if peat degradation is included) — and that is assuming, unrealistically, that emissions from deforestation, forest degradation and peat degradation can be completely eliminated. Therefore, reducing fossil fuel emissions remains the key element for stabilizing atmospheric CO2 concentrations. Of course this does not mean that we do not need to stop deforestation. “Even our revised estimates represent substantial emissions, and for about 30 developing countries, including Brazil, Bolivia, Indonesia, Myanmar and Zambia, deforestation and forest degradation are the largest source of CO2,” Van der Werf and his colleagues write. But it is difficult to imagine a clearer explanation of why the carbon stored in forests should not be traded against continued greenhouse gas emissions. To prevent runaway climate change we need to stop burning fossil fuels and stop deforestation. We cannot trade off one against the other. There must be some good models out there..
does the REDD-Monitor cover this?? address the successful projects?? Interesting…but very questionable and based on both carbon mass per hectare throughout the tropical realm. If this is the case the opposite is the situation; 22% of carbon sourced is an absolute minimum figure; 1.5 – 2.0GtonnesC out of 8GtonnesC sourced is a minimum of 21.88% from the oxidation procees and futher emissions does occur in both tropical and non tropical peatlands! This is basic fact and has been known in the scientific community for three years or more. Ecologists have to understand the full plethora of sinks for sequestration and storage; living structures….notably the phanerophytic structures of spermatophytes and bryophytic morphology of their palisade structures in so called peatland “soils”. To be honest the full nature of carbon sinks are unknown; the issue is not just carbon sources and available sink structures which occur globally and in throughout the biosphere and other interactive realities have to part of the support for ecological systems throughout our planet. This is not just a sink activity for carbon storage but a mechanisms for not only shoring up our current nefarious economic activities in tropical and extratropical realms but also to support the continuance of evolution and the improvement of providing means to bring human goal development to fruition. I feel that the authors should relate to some basic ecological realiites of net primary photosynthetic production of carbon (and biomass) and then reassess their analysis on each country of planet before making such sweeping comments and not site pernickity results based upon untested and unrepeated and therefore not fully investigated science. If they would care to benefit from the data I have made available in my SEEBif Initiative then they may realise that the whole nature of the sink and seqestration processes is much more complex and should not be hijacked by those who only see “rainforests” as such areas of priority. In response to Jon Anderholm, I have to disagree with his notion that there could be “some good models out there..
for afforestation / reforestation”. Tree plantations are not intended to function as an ecosystem – they are industrial production units that convert water, nutrients and gases into wood that is ultimately destined to end up as garbage or as CO2 and methane that goes back into the atmosphere. The only difference is that some, such as the 40 year old spruce plantations in southern Sweden just take a bit longer to complete the process than eucalyptus pulpwood plantations in Brasil. In the end they just keep increasing greenhouse gases through the industrial manufacturing processes, transportation, soil carbon losses and land mismanagement that usually go with plantations! Admittedly some plantations are definitely worse than others but in the final analysis they are all bad! There are plenty of “good models elimination of forest degradation and deforestation”: they are called indigenous territories, and they have all been achieved without the help of a single cent of carbon funding – just a lot of political will, and a lot of very determined campaigning by indigenous peoples and their supporters. The current obsession with REDD funding is just a distraction from the need for tropical countries to do the obvious, though poliltically unpalatable, thing. in REDD it avoidance of deforestation is not allowed. What is the alternates for wood products. The use of other minerals would only create further Co2. Most of the developing nations in the tropical areas have renewable fiber such as coconut fiber. sisal fiber, jute fiber, oil plam fiber, pineapple fiber, banna fiber, etc. thes could be classified as RAPID RENEWABLE MATERIALS. Most are today agro wastes in the rural areas. If like renwable energy, or renwable biofuel these could be brought into main stream as BIOWOOD then you would see a driect benefit. With economic growth of 6 to 8% where are we going to meet the demand of wood. Otherwise this shortage will create further illegal logging. @ Wally Menne – Agreed, plantations are not forests, and the substitution of intact forest ecosystems with plantations under a misguided, co-opted, watered down post-Kyoto framework is something that should keep us all up at night. But why assume that all Aforestation/Reforestation (AR)projects need to be plantation-based? Surely best-practice ecosystem restoration, informed by pre-existing species distributions/densities and local environmental knowledge, which values biodiversity and socioeconomic well being alongside CO2 sequestration, is an attainable standard which we should be insisting on. My concern is that by writing off forest-based offset schemes as inherently unworkable, we preclude (or at least impair) the possibility for good, equitable, stakeholder-driven, carbon-financed forest restoration work, which is after all unimaginably important, not only for climate stability, but for a slough of other localized imperatives with which REDD Monitor’s readers are no doubt familiar. Your underlying argument – that shoddy AR projects exist therefore all AR must be fundamentally shoddy – is part of the same logic which has unfortunately characterized offset criticism (with it’s otherwise very legitimate, very important concerns) in the last few years. It seems to me that if every commentator, activist, or organization which values ecological integrity and social justice decides that ‘AR means monocultures’ or ‘REDD is bad for people and forests’, then we veritably guarantee this will be the case. Scary. The underlying assumptions of most estimated on deforestation-related emissions are based on deforestation figures reported by countries to the FAO. In reality these figures relate to net change in forest area (ie total areas lost minus total areas that became ‘forests’ (ie plantations, regrowth, etc). Such ‘net deforestation’ figures mask the amount of forest biomass lost through emissions. ‘The new paper and other papers and IPCC reports published in the last few years, lead us to conclude that the percentage of global emissions of CO2 from deforestation and forest degradation is less than the commonly used figure of “about 20%”. The best current estimate would be about 15% if peat degradation is included. Given the uncertainties involved one can not rely on estimates to the nearest 1%. The change in the estimate is due to several factors, including increases in fossil fuel emissions as well as revision of the estimates of deforestation emissions, due to new data and scientific analyses. The change is NOT due to a decrease in deforestation since the 1990s, and in fact the analyses agree that global deforestation in the early 2000s has been similar to that in the 1990s. So, this new estimate is NOT a sign of progress. This figure includes deforestation, forest degradation, and peat emissions from deforestation and degradation (including later decomposition and fires in peat from previously deforested areas). These changes and the new paper are typical of how science advances, and reflect our improved ability to measure the emissions due to deforestation. They reinforce the point that reducing emissions from tropical deforestation is critical to slowing global warming. These emissions are comparable to the emissions of all of the European Union, and are greater than those of all cars, trucks, planes, ships and trains worldwide.